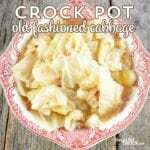 Crock Pot Cabbage Recipe: This super easy recipe tastes just like grandma used to make! Tender cabbage with the savory flavor of bacon and onions makes the perfect side dish for any family dinner. Cover and cook on high for 4 -6 hours or until cabbage is tender. I used one of my favorite 6 qt slow cookers to whip this up. You are going to want a large slow cooker because it will be quite full until the cabbage cooks down. We like our cabbage VERY tender, so we tend to cook it longer. If you like your cabbage a little firmer, just reduce your cooking time. We LOVE using real bacon crumbles to skip the step of frying bacon. If you would prefer to cook your own bacon, go for it. Similarly, we LOVE the flavor those little baby pearl onions in the jar bring to the table. You can usually find them in vegetable aisle or the same aisle with the pickles. However, if you want to use regular onions instead, I would just chop one up and cook them a little in your bacon grease before adding to the cabbage.